Who doesn’t love a trip to the farm? Well, you’ll love it even more in this novelty book by the wonderful Axel Scheffler. It’s a farm in a book! It’s got moving machines, quacking ducks, mooing cows, neighing horses … all the things you’d find on a real farm. The only thing it’s not got is the smell, which is all good! 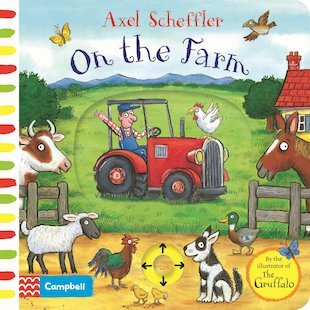 Pull the sliders, turn the wheels and make the animal noises for hours of farmyard fun. PS: think the pictures look a bit familiar? Well, Axel is the genius artist who illustrated The Gruffalo and Stick Man. Even more reason to buy this!